A few tasty products made in or around the Bay Area. 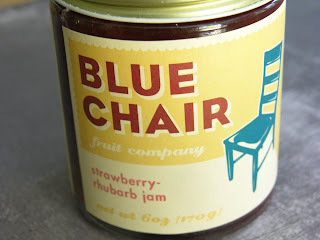 The Blue Chair Fruit Company in Alameda makes some delicious jams and marmalades for your breakfast breads. They make their preserves in small batches in French copper jam kettles, and the varieties change with the season. My favorite so far is the strawberry rhubarb jam. You can find them at the Temescal Farmer’s Market in Oakland or at one of these local markets. 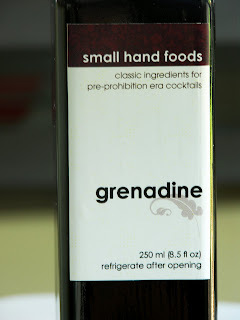 Recently at Cask I found a tiny display of hand crafted syrups by a local company called Small Hand Foods, and I decided to try a bottle of the grenadine. Until a few weeks ago I had never heard of Jennifer Colliau or her company, but now it seems that I find her products everywhere. (Not surprisingly, they were mentioned in Jeff Hollinger’s class on house-made bar ingredients.) Colliau, a Bay Area bartender, created the syrups so other local bartenders could have access to quality ingredients for their cocktails. Now they can be found in a variety of local bars including Absinthe, The Slanted Door, and Flora, just to name a few. Last night at Sidebar, I had the pleasure of sampling the pineapple gum sryup in the Castle Harbor Special. I’ll be heading back to Cask to get a bottle of it for myself as soon as possible. 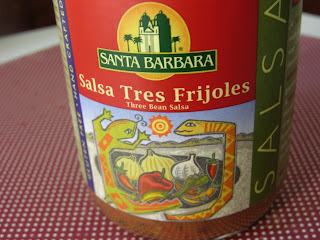 Though their salsa is now sold in almost every US state, this company got their start in Santa Barbara, CA in 1984 when the company’s founder made the salsa for his restaurant. Customers began asking for salsa to take home with them, and I think you can guess what happened next. They make both fresh and jarred salsas, and though I’m not usually a huge fan of jarred salsa, I really like the Habanero Lime. Located in Petaluma, CA, this creamery produces many varieties of cheddar and jack cheese. So far I’ve tried the Sage White Cheddar and Mike’s Firehouse smoked cheddar (it will make you crave Hickory Farms Summer Sausage like you wouldn’t believe—thankfully we had one hanging out in the pantry from the fall.) 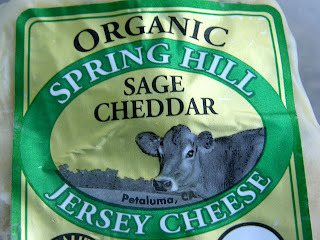 Spring Hill also produces butter, cheese curds, quark, and a few raw milk cheeses. (Next on the list to sample is the raw milk cheddar.) You can find their cheese online or at the Temescal Farmer’s Market, where the nice cheese people will let you sample their wares.